This square is called Angels Around the World, with four angels standing on the center circle. 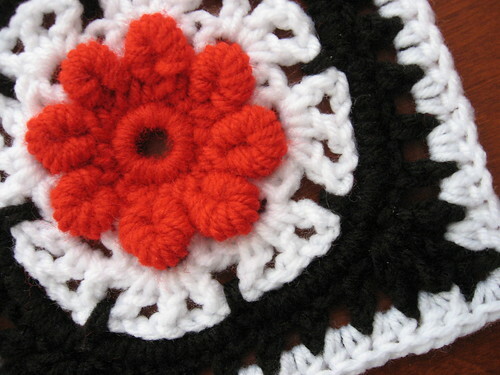 Bonnie Pierce did a wonderful job writing the pattern clearly and concisely, but I really had to pay attention to get every part crocheted correctly! 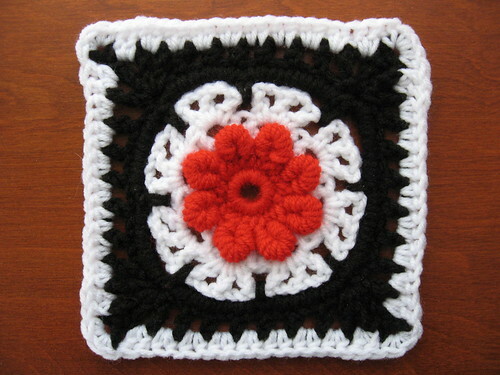 I’m glad that I have made a few Daisy Flower Crochet Chairty Squares, because the construction was similar. The angel skirts and bodies are crocheted as joint rows with the background and then the angel wings and heads are added with separate lengths of yarn. There are about ten ends to tuck in for one six inch square! 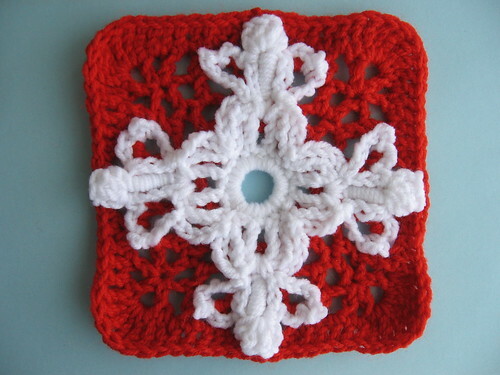 The Lacy Bullion Heart square was the easiest square out of the bunch. The center of my heart has a spiraled look, which doesn’t show in the sample picture. Next time I will chain-one more loosely; that might fix the swirl look. 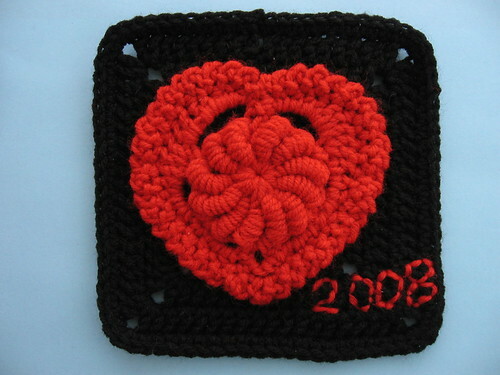 I added the ‘2008’ after sewing the heart to the black square. Even though I pinned and basted the heart on the background, it wasn’t centered very well, so I added the date to balance the square out. I had to eliminate one or more rows from each of the squares to get exactly six inches across. Even with a size E crochet hook, I could never get the correct gauge. Red Heart Super Saver runs a little thicker than other worsted weight yarn and I’m guessing that was part of the sizing issue. I made the Grannyesque Headband with random tan wool I had from my stash. The yarn was bought by my grandmother, so I’m guessing it’s Mill End yarn. There’s no label to go by, anyway. 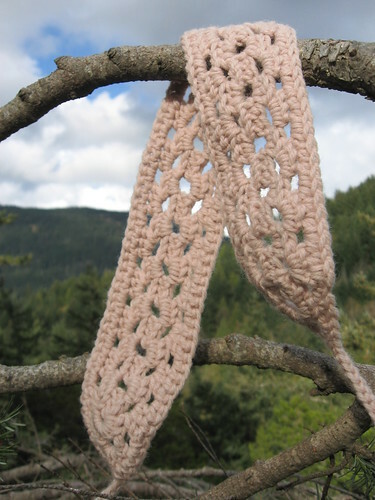 The headband pattern is so easy, with granny shells and triangular ends. My favorite part were the ties, which are written into the border. I love patterns that start and end with the same length of yarn! Here’s a picture from the garden. 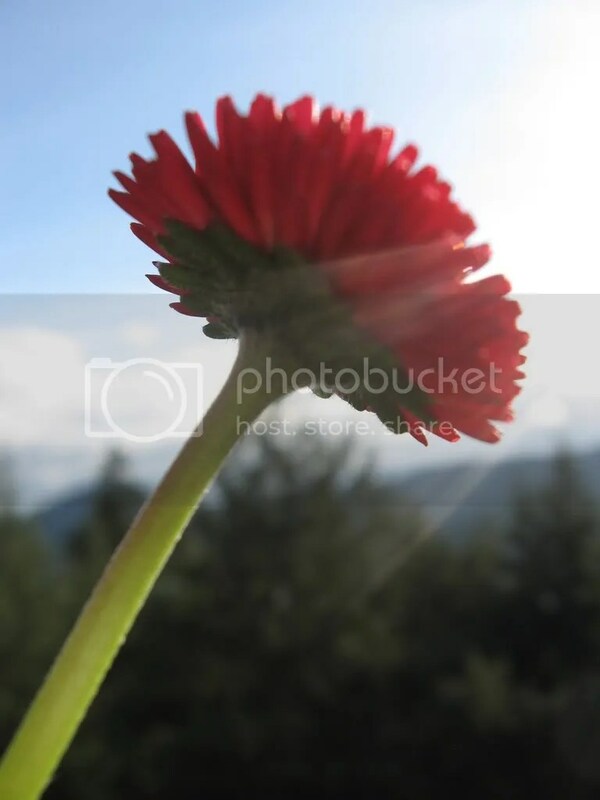 I like how the light bends around the petals. I wonder if there’s a ‘rule’ in photography not to have a strong line end in a corner. The stem angle looks off to me, now that I look at it. According to the Thai solar calendar, the color associated with Wednesday is green. 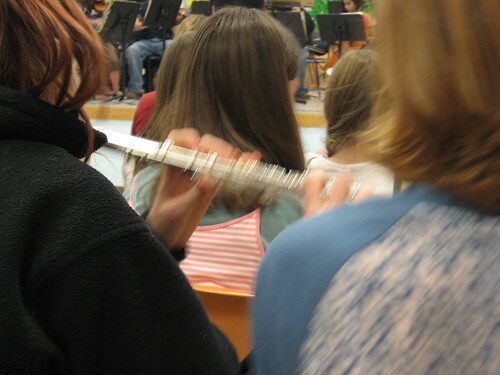 I attended the winter music concert for the local high school today. The kids did an amazing job and I really enjoyed hearing the strings. I love watching the bows bounce across the violin during a performance. Plus the kids played a song called the Regal Overature and part of the song required them to pluck the violin strings. The other sing titles I remember are Procession for a New Day and Brandenburg Concerto No. 3. All nicely done. When I was at the school I got a chance to chat with a little five year old I formerly babysat and she graciously tried on my two finished Soley Granny Squares Hats for me. I wanted to see if my sizing estimations were correct. When she put the smaller hat on her head it was clearly too tight. She looked up, then leaned close and whispered to me, “My head is too big”. That little girl is still the cutest! Unfortunetly I couldn’t get a photo as my batteries died on me. 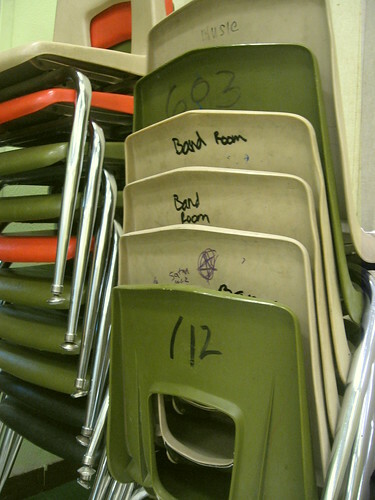 I must have taken too many pictures of these chairs from the band room. I just thought the handwritten numbers were interesting. The little purple message is also informative. I spent half of high school in Massachusetts and ‘yeat’, or for added emphasis ‘yeat da bun’, was a very popular swear word to write on school property. The word was banned from school vernacular but it was inked on bathroom stalls, etched into wood desks and written anywhere else conceivably possible. The origin and meaning of the word was not obvious and I remember a few debates as to what the word literally meant. The school newspaper even had an article on the word once where the author attributed the word to horse dung. The article about ‘yeat’ from the online Urban Dictionary doesn’t mention horses though. Has anyone else heard of this slang word? Stay tuned. The next post will have more of Crafty Christina‘s Soley Granny Squares Hats!